American Express One Card – New Card Launch. In every relationship there is a spender and a saver. 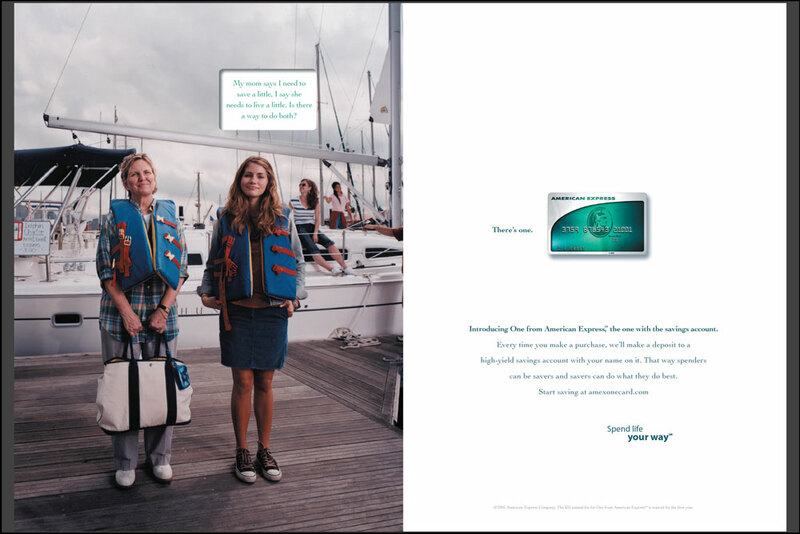 Ogilvy identified a segment of high value consumers who should have been carrying the American Express card but weren’t. The trouble was the brand didn’t appeal to them. The challenge was creating a new product that would appeal to this audience and grow the franchise rather than cannibalize existing American Express brands. The One from American Express® card offered a value proposition of automatically putting 1% of a consumer’s spending into a high-yield savings account for the future. Print example: Mom says her daughter needs to save, her daughter says Mom needs to live a little. Research uncovered that the audience segment respected the brand, but the success that American Express stood for in their minds did not match up with how they defined success. To this audience, success was defined by living “a” good life, defined by individuals on their own terms, opposed to “the” good life, traditionally defined by material things, power and prestige. They want to get the most out of life today while still being responsible about tomorrow. To them, living “a good life” is entirely about balance, and American Express had never shown them that it understands that. “You’re either a spender or a saver”. We all know the dynamic. It’s universal. It’s instinctual. It’s the angel on one shoulder, devil on the other. Talk to a spouse, a boyfriend or a parent and they have no doubt who falls into what camp. And it was funny. It sparked conversation, stories past, light-hearted frustration (money, like it or not, is a huge emotional factor in relationships). We all have spender and saver moments – but come right down to it, we’re one or the other, some of us to a fault. is there a card they can both use? It was a full media effort with TV, print, online, and branded content. Television commercials followed the lives of several children, born either a spender or saver, and how that behavior influences events in their lives. And how One from American Express® helps them do good for themselves regardless of their habits. It allows spenders to finally feel great about spending and savers to feel even better. 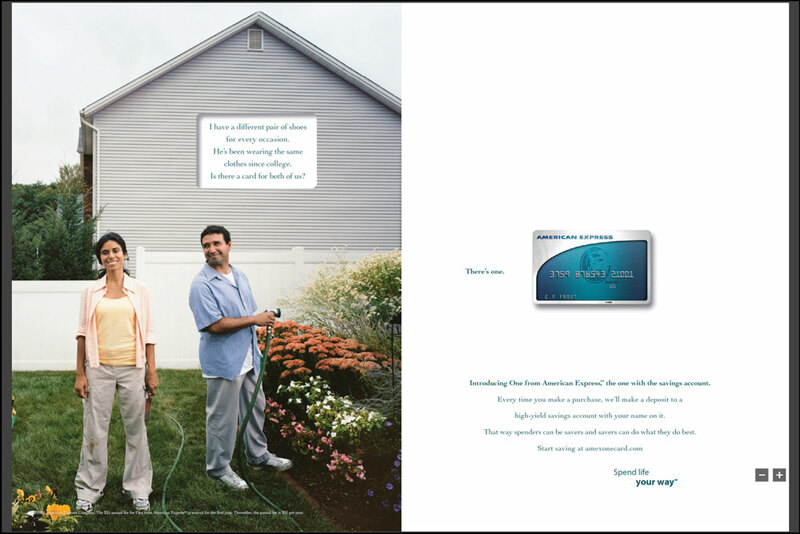 In print, the campaign capitalize on another angle of the spender/saver dynamic: the conflict that lives within all relationships – be it partners, family members or spouses. Brand television was directly responsible for nearly 50% of card applications. One from American Express® cardholders exceeded spending forecasts by 60%. Targeting a larger audience segment increased key brand metrics: overall perception of the Amex brand increased by 53%, trust in the card brand increased by 45%, and belief that the brand helps build financial security increased by 55%. 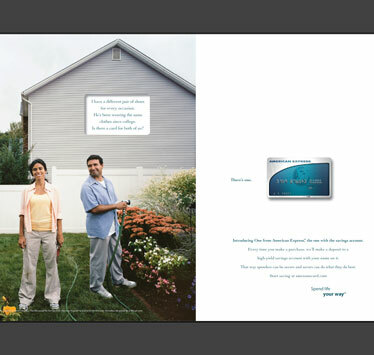 Additionally, Ogilvy and American Express won a 2007 Silver Effie award in the Financial Services category (honoring the most effective marketing communications ideas) for the campaign.